Although this story started off in a really similar way to my son Theo’s birth, it ended very differently. I had assumed that, as.my second baby, this one would be more on time than her big brother, but sadly that wasn't to be. Having an induced labour last time was quite a miserable and tiring experience, so I had been really hoping to avoid the same happening again. As her due date of 18th July approached, I was literally trying every single old wives tale and home remedy to trigger labour - raspberry leaf capsules, evening primrose oil, eating pineapple and curries, going for long walks - I even tried acupuncture for the first time. Absolutely none of it worked for me. This made me feel extremely let down by my body. Why didn't it know what to do naturally? I spent the week in a very low, frustrated mood hoping for any sign of her getting ready to arrive into the world. Even the sweep failed - my cervix is posterior, so they can never perform it properly. So induction was to be our fate again. With Theodore, this meant a miserable, exhausting three day labour, a longer hospital stay, and an assisted delivery with episiotomy. So I was less than pleased to be facing it again, but the hospital booked us in for Sunday 29th and I had to resign myself to it. Perhaps I was still secretly hoping for a last minute natural labour, but that didn't happen. Waking up on Sunday morning, we called the maternity unit and they asked us to come in for 10am. Perhaps the silver lining was being able to calmly wave Theo off with his little Trunki to go and stay with Granny. He’s so happy there which is lovely as it means I worry far less. Walking through the doors at the hospital, I felt that curious cocktail of emotions - apprehension, excitement, nervousness, and just a little touch of joy. So far, so similar to Theo’s birth - I was even in the same bed on the induction ward! I was strapped up to the monitors for a couple of hours so that they could check everything was okay with the baby, and then they came to insert the hormone pessary. After that, they tell you to go for a walk for around an hour to try and get things started, so there we were, shuffling around the hospital grounds - again, exactly like when we were expecting Theo. Again, I began to have some mild cramping pains. We got back to the ward, and after some more time strapped to the monitors, the midwife asked me if I wanted to stay in or go home. This was a game-changer. Last time, they wouldn't allow me to go home once they'd started. I was so miserable- hospitals are atrocious places to try and rest, so light and noisy. After a couple of days of no sleep and low-level pain, I was thoroughly fed up - I spent most of the second day crying in bed with the sheets pulled up over my head, and I remember sitting in the car park with Sebastian, begging him to kidnap me! So I jumped at the chance to go home this time. I knew I would be more comfortable and relaxed there - the idea of curling up under my own duvet with a cup of tea cheered me up no end! So back home we came at about 3pm, although we decided to leave Theo on his sleepover with Granny as planned. I thought we probably had quite a while to wait. The midwife called to check on me at 6pm and all seemed calm. We made some dinner and then decided to go for a short walk around the neighbourhood. During this time, I was experiencing slow, crampy pains - probably about a 6/10 for pain, so I estimated that it was very early days in terms of the progression. I prepared myself for a long, stop-and-start day or two. On the way back, round the corner from home, my waters broke. It wasn't a huge amount, so I was second guessing what it actually was. 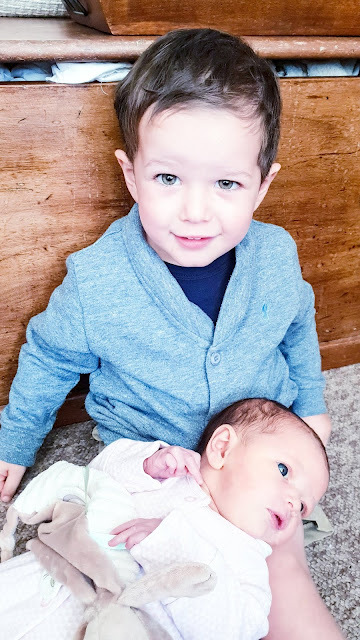 When we got back, Sebastian thought that we should call the midwife back to let her know about the fluid loss, and she told us to come back in when we were ready. I still felt like I had a long road ahead, and I wasn't in too much pain. I didn't think I was in ‘proper labour’ because of this, so I decided that I wanted a bath. I climbed in and Sebastian brought me a cup of tea. I was having more cramping but I didn't think they were proper contractions. When I got out of the bath and dried off, we got into the car and made our way back to hospital. In the car on the drive there, my pain was getting a little worse - enough to stop me talking, so I began to believe I was in labour. I recall the contractions were quite unbearable when I was delivering Theo, and this wasn't as severe, but it was slowly getting tougher. We arrived and were shown straight into a labour suite in the birth sanctuary, which is the less medical part of the hospital. The room was quite relaxing, with soft lighting and a smell of lavender oil. There we met with our delivery midwife, who was also super calming and positive. Then came a big shock - when she examined me, she told me I was fully dilated, the baby was coming now, and I needed to start pushing! I was speechless. I hadn't really thought I was in proper labour until we arrived at hospital! I had a couple of quite painful contractions then with some blood loss, but I couldn't have any pain relief because it was too late! When I realised that I would be delivering the baby without anything to help, I was very scared but there was no choice but to grip Seb’s hand, grit my teeth and get on with it! The pain of pushing out the baby is different to pain from contractions, and somehow more bearable for me- perhaps the thought that we’d be meeting our daughter in a few minutes was the encouragement I needed. All of a sudden, things got a bit scary. A doctor and some others came into the room and my midwife told me it was very important to get the baby out in the next couple of pushes. Later, we found out that she had the cord wrapped around her neck and was in distress, but they didn't tell us at the time to stop me panicking. The doctor told me that he needed to make a cut and use the ventouse to help her out. This was what happened with Theo as well, only with him I’d had an epidural, so I couldn't feel anything going on. I was frightened, but then they were telling me they could see the head, and I could feel her coming into the world. A couple of pushes later and she was laid on my chest. We had only been in hospital for an hour! I didn't cry, mainly because I was in so much shock at how quickly things had gone. Sebastian cut the cord and I lay there holding our little lady while they delivered the placenta and did my stitches. That bit was probably more unpleasant than the pushing. They checked and weighed the baby - at 8lbs 8oz she was certainly quite large, a whole pound heavier than Theo was! We spent quite a while in the suite, cuddling and bonding, having a shower and some of the legendary marmalade toast and tea (the toast they make you after you give birth is, quite frankly, the best thing you will ever eat in your life). At about 3am, we moved upstairs back onto the general ward and Sebastian had to say goodnight to us and head home. I cheered myself up by thinking it would only really be a few hours until he could come back. She was feeding on and off until the next morning, so I didn't get much rest, but she was also much less fussy than her brother, and happy to be put down into the cot in between, unlike him! That meant I could grab grab a shower and some breakfast in the morning, thank goodness. When Sebastian came back in, we were just sat around waiting for all the various checks and tests they have to complete on mother and baby, which took most of the day. We had decided that coming into hospital might freak Theo out, so we were planning to wait until we got home to introduce him to his little sister. After she'd been checked by the paediatrician, there was a worry that she might have fluid on her lungs. We had to take her down to the neonatal unit for some tests and I got a bit emotional - partly with worry and partly with the thought of not being able to go home and see Theo, because I was really missing him. There might have been a few tears! Luckily, she was given the all clear and we got to go home at about 5pm. Introducing Theo to the new arrival was very special. He has taken to the change amazingly well and is being so kind and caring with her, which melts me. Now we're trying to balance things so that he still gets lots of attention. We’ve named our little girl Romilly Hero Susan, and already she's such a blessing. We feel so lucky to have her. Now we're trying to settle into family life as a four, and get used to sleepless nights and breastfeeding again! Here’s to new adventures as a four!